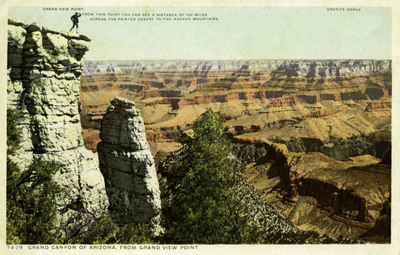 "Arizona – Grand Canyon, from Grand View Point"
From this point one can see across the Canyon, across the Painted Desert to the Navaho Mountains 125 miles away. Also Newberry terrace, the Angeles Gateway, Vishnu Temple, Solomon's Temple, Sheba Temple and Apolio and Venus Temple may be seen. A half mile below the rim is Horse Shoe Mesa. Trails lead in all directions from Horse Shoe Mesa to the lower depths of the Canyon. Grand view is 10 miles up the river from Bright Angel Trail as the crow flies and about 16 miles by wagon road.